Five very different articles in this post. Starting with a global competition for all things sketchy, a big renovation for the Eastcote House Gardens in England due to a big money influx and great news for vegetable gardeners in Los Angeles. But there’s more. A proposal for a 27 acre botanical garden in Delaware, I’ve included the plan view of the proposed garden, and finally a few words from the artist Andy Goldsworthy on a installation he is doing for the Presidio in San Francisco, CA. Sketch maniacs, masters, fans and admirers here is our fourth edition of Sketchy Saturday Top 10! Watch out because it’s becoming popular and the competition is global. We are looking for diverse techniques, well structured, executed emotion, particular beauty and sketches with a personal touch when ranking. Take a look at the competition and don’t miss out on sending in yours! RESIDENTS and voluntary groups in Eastcote are celebrating following news that Eastcote House Gardens has been awarded £1.28m by the Heritage Lottery Fund. An application was made by Hillingdon Council, in partnership with the Friends of Eastcote House Gardens, to enhance the buildings and grounds. The application was one of just 11 in the UK to succeed under the charitable ‘Parks for People’ scheme. Funding will be used to significantly restore and improve the historic gardens, known for the timber-framed 16th Century stables and mature parkland that were once part of the grounds of Eastcote House. The grant will also enable the repair and upgrading of the listed stables, 18th Century dovecote and walled garden for educational and recreational use, while a new building will house a new café. The volunteer group, Friends of Eastcote House Gardens, who have won many awards for their beautiful floral displays, will get a gardeners’ compound for training new volunteers. Younger residents will be able to explore the stunning gardens, enjoying pond dipping, a new ecology walk and natural playground, while schools will benefit from the outdoor classroom. The Los Angeles City Council gave its blessing Tuesday to neighborhood gardeners who want to plant vegetables on public parkways, voting to waive enforcement of a city law that makes the activity illegal. City law requires parkways — the area between a sidewalk and curb — to be “free of obstruction,” including vegetable gardens. The council, on a 15-0 vote, approved a motion to suspend the law in the case of vegetable gardens. The practice of planting gardens on public space, often called urban gardening, has been taken up in recent years in communities with limited access to fresh produce, as well as by avid community gardeners. GEORGETOWN — A group of botanically minded Delawareans is planning to open a 37-acre public garden near Dagsboro three years from now, and has approached Sussex County for permission to make it happen. 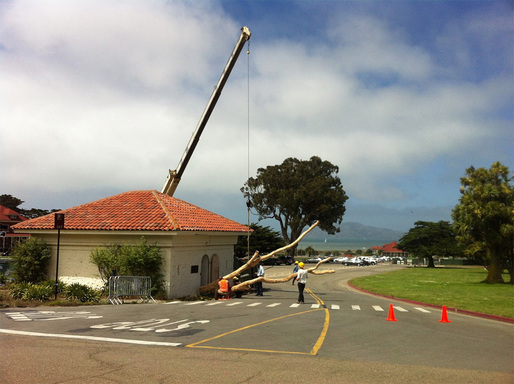 That Art newspaper link leads to this small story about an installation work Andy Goldsworthy is installing at the Presidio in San Francisco. I have went to the “trouble” of C&P’ing the story. *** You can learn more about the Presidio and Goldsworthy at the Presidio(dot)gov site. Previous PostPrevious Eisenhower Memorial is it the Right Memorial? Next PostNext Deer Resistance, is there Hope?